It may seem common sense, but just in case, be sure never to use a grill inside. When choosing a place for your grill outside, be sure to keep it far enough away from your house, garage, and patio–the optimal distance for your specific grill can be found in its manual. Keep your grill away from trees and other plants. Never place your grill near a walkway or children’s play area. 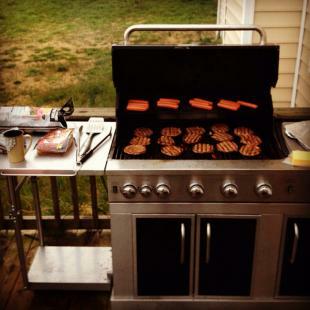 The main problem in gas grills is obstruction of the fuel path. This is usually caused by a buildup of dirt and debris in the tubing. Before lighting up, take apart your grill to ensure gas is flowing correctly. If you notice a problem while grilling, turn off your grill, disconnect it from the fuel, wait until it has cooled, then inspect for melted or blocked parts. Charcoal grills cause far more fires than gas grills. The reason? Lighter fluid. Never add lighter fluid to hot coals; always add it before you light the grill. Adding fluid after the coals are hot can cause flare-ups and singed eyebrows. Always follow the directions on the packaging for best results–and have a fire extinguisher handy. Keep yourself at a far enough distance from your fireworks. Handhelds (such as sparklers) should be held as far away from the body as possible. Never place any part of your body over the fuse while lighting a firework. Light fireworks one at a time and quickly move a safe distance away. Don’t carry fireworks in pockets or throw them at others. Never allow young children to ignite or play with fireworks. Even sparklers can cause injuries in children, burning close to 2,000 degrees. Even older children and teens should be supervised by an adult when using fireworks. A bucket of water or garden hose is essential to keep nearby when using fireworks. Water is useful both in case of fire and for ensuring used fireworks are safe for disposal. Always soak used fireworks in water before throwing away in order to prevent trash fires. Even if a firework is a dud, soak it before discarding.